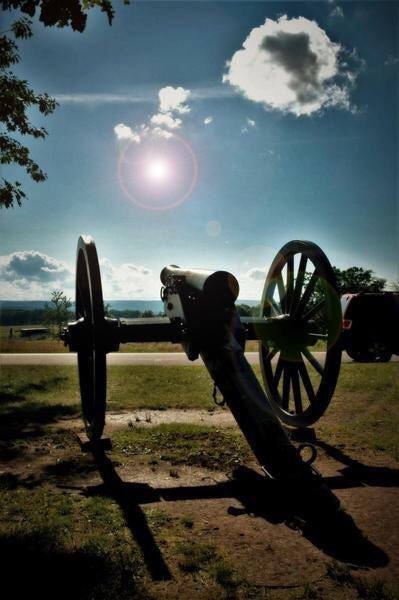 Tourism and Patriotism are two things that are alive and well in the historic Civil War battlefield town of Gettysburg, Pennsylvania. Thanks to the hard-working, law-abiding citizens of our fine country, with a special thanks to the Veterans and everybody who supports their efforts. Because of these great people, America remains a free, clean, and secure first-class nation. Evidence of this fact was fully on display during the 154th anniversary celebration and reenactment at the Battle of Gettysburg. The masked militants of AntiFA, who emulate the tactics and appearance of ISIS, have been identified by the State of New Jersey as a terrorist organization. They recently issued threats of violence and vandalism toward the hallowed ground of the Gettysburg Battlefield. On July 1, 2017, as the American Patriots mounted a strong show of force with 1000’s of people who traveled in from out of town, it was clear that the ranks of AntiFA were dwindling, and their inability to have a presence at this event was a humiliation to their organization, symbolizing a major blow to their credibility as a supposedly relevant influential factor in America. Initially being credited for issuing the #AntiFAban, thus leveraging AntiFA to avoid rioting in Gettysburg, the author and publisher of the original report have now been identified and targeted for future violence by the terrorist organization. 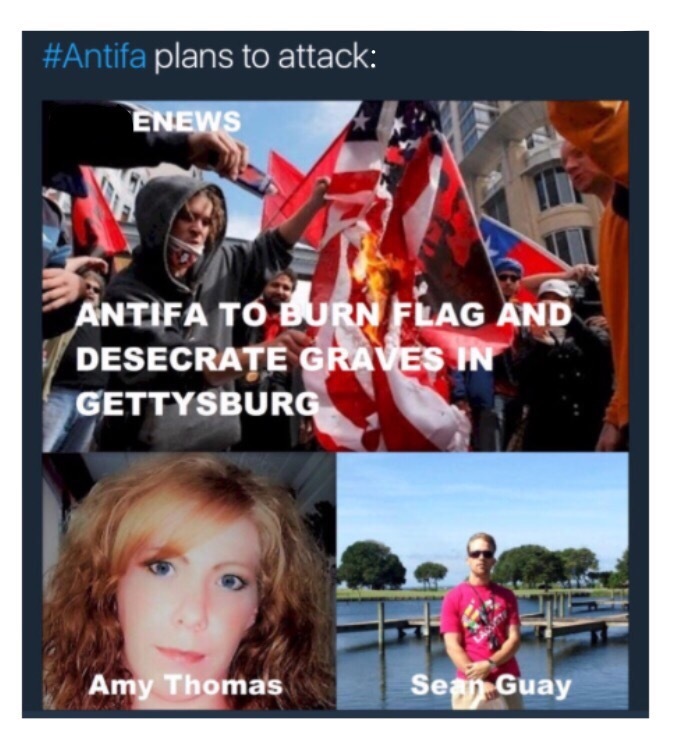 As it is being reported in Europe, and according to the mainstream American media narrative, AnitFA didn’t apply for permits to be in Gettysburg (they did and were denied), and ‘Trolling Trumpsters’ is an alt-right controlled fb page that initiated the rumors (its actually controlled by AntiFA affiliates, as is the Harrisburg AntiFA fb page). 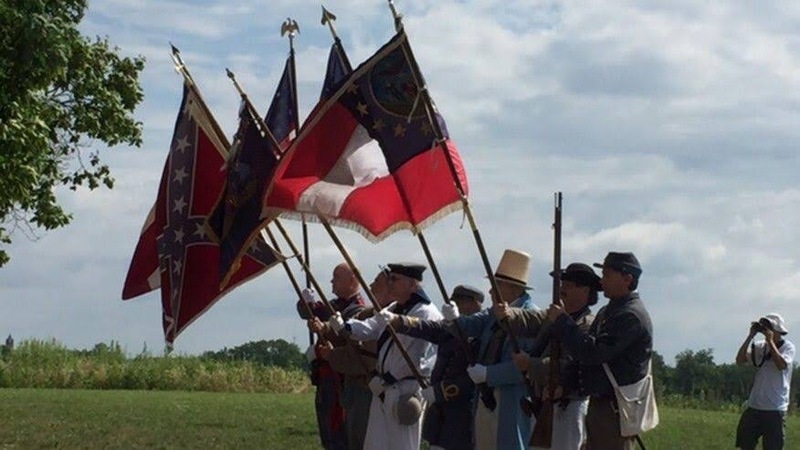 Reports surfaced that a Confederate supporter, whose identity has not been disclosed, brought a revolver to Gettysburg National Park and accidentally shot himself in the leg. The incident took place around 1 pm. Pennsylvania lightfoot militia Thanks you for telling the truth. None of us do this for recognition but simply because it’s the right thing to do. Thanks again!